It is always good to take time off from work and rest. 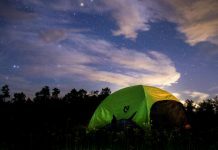 While many use their leisure time for vacation and touring, others invest theirs in camping and having a good rest away from home. 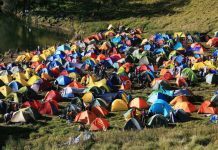 You definitely won’t be standing or walking about aimlessly during your camping; you will be needing tools such as tents and camping chairs. There are many camping chairs readily available in the market but what separates them are their quality and portability. 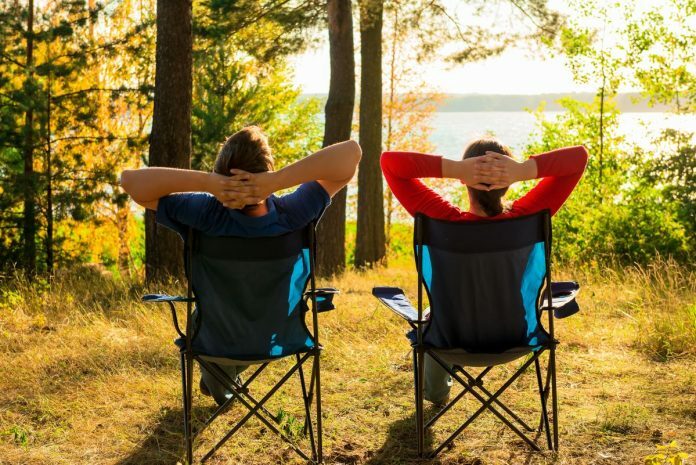 You wouldn’t want a camping chair that will be a burden to you so it is better to go for one that gives you the much-desired comfort. We have taken the time to take into account the stock of camping chairs in the market and we found KingCamp models a better option. We have made some selections from available KingCamp chairs and selected the best five. These chairs measure up to standard in their lightweight and other impressive features that will assure your comfort. It will be a good approach if we take a look at the company behind KingCamp chairs. KingCamp chairs are from the stable of KingCamp Outdoor and Products Company. 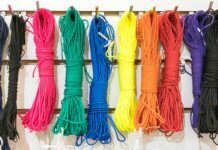 The company is one of the biggest and pioneer manufacturing companies in China and specializes in outdoor and camping products. The company partners with Italian, Korean and Taiwan companies and has been in the global market since 1997. The company has about 100 recognized dealers in China and about 30 distributors across the world. 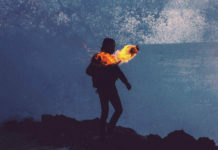 Its services cuts across tents, sleeping bags, camping chairs, rucksacks, backpacks, camp kitchens, lighting, waterproof coats, windproof pants, and jackets. The KingCamp Low Sling should be your best choice if you’re looking for a camping chair that will serve you well during your camping. The chair packs those impressive features you’ll definitely need such as comfort and portability. The chair has a 7.9” seat height and this seems a befitting height for you. Whether you’re short or tall, the height will certainly measure up to your taste so you’re sure of being comfortable on the chair. If you’re looking for a camping chair that is spacious and can hold your frame, the Low Sling is a good pick. The chair features a width of 20.8” that can contain your frame. So whether you’re big, huge or slim, there is enough space for you. 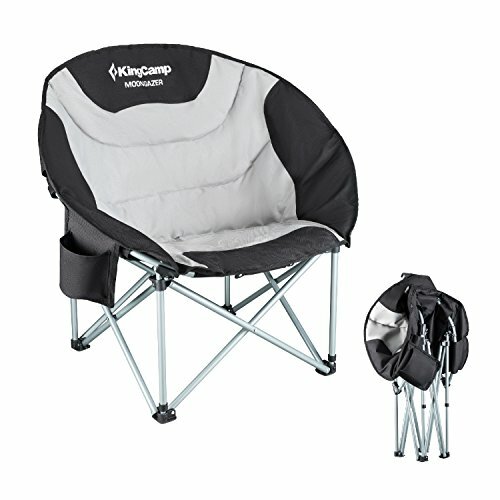 If your search extends to a camping chair that can hold your huge frame, you should consider getting the KingCamp Low Sling. It features a 6.6 lbs weight capacity that is approximate to 3kg. That is not all about the weight. Its heavy duty frame can actually hold a 300lbs or 136 kg body frame. 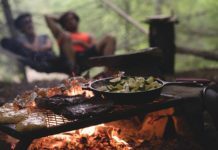 It is a known fact that most campers don’t joke with their comfort and they can go to any extent to get that. It is for this reason that the KC Low Sling was designed with a cup holder to keep your drink close to you. You don’ have to get up to get a drink because, with the cup holder attached to the chair, you can simply dip your hand and take a sip from your drink. The chair also has features that harp on its comfortable design. There is a breathable and comfortable mesh back and seat for your comfort. You don’t have to get up when you feel pain while seating because the chair has pores to allow air into the seat. It also features a big leg cup and low seat that stabilizes it and this feature allows you use it on the beach. If you’re looking for a camping chair that is portable, this chair is for you. It is easy to open and close and you can do this in seconds. Many campers avoid camping chairs that have metal hands because this keeps them uncomfortable. The King Camp Low Sling also offers comfort in this area by providing armrest padded by foam. The foam covers the metal frame of the armrest and allows you rest your arm there without any discomfort. Another feature that cannot be overlooked on this chair is its portability. There are a carry bag and compact straps that allow you to transport the chair easily. You can easily stow it away in your car trunk and easily transport it to and from your campsite. 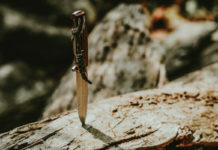 When you consider the impressive features it packs, you might be forced to believe the Low Sling model is costly but it is actually affordable. 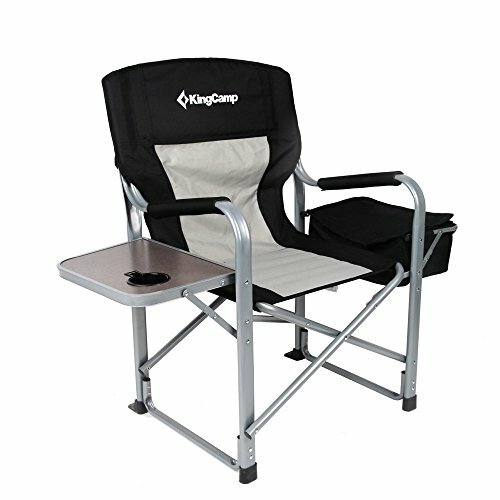 KingCamp Director’s Chair should be considered if you’re looking for a camping chair that can be stored easily. It has a red steel frame that supports a body frame of about 330lbs (150kg). There is a 17.3” seat height that can hold the tallest of campers and the 20.8” width can comfortably hold your frame. If you’re looking for a camping chair that can hold your body frame, you should pick the KC Director’s Chair. There is a padded hard armrest that adds more comfort. The amazing feature of this model is its quick reflexes; it can set and fold in seconds. Its 36.6 x 22 x 7.1” packing size compresses the actual size of the chair and makes it easy for storage, setting and folding. If you’re looking for a camping chair that can be used in many scenarios, the KingCamp Director’s Chair is the best pick. It features a firm and comfortable design that makes it suitable for car traveling, camping and fishing. The seat is also designed with a breathable and moisture-wicking fabric that is comfortable to sit on. The name rightly suggests what the chair has to offer. There is a side table attached to it. You can keep your snacks and drinks here while you bask under the sun. You might be in need of cold drink while resting and there’s a provision for that on this one. You don’t have to bother yourself about getting a refrigerator to your campsite because the KC Director’s Chair features a 14.2 x 9.8 x 5.5”cooler bag that keeps your drinking camping bottle fresh. The downside here is that the product might be a bit costly. We have yet one of the best zero-gravity camping chairs on our hands and that is the KingCamp Lounge Chair. The product comes with impressive features that’ll keep you drooling. Firstly, there is an oversized 65 x 27.5 x 44 body dimension that keeps you comfortable. It features a comfy and soft double clip Oxford cloth material. The backrest features a curved design that keeps you well-postured. When sitting on the chair, your knees and chest are well-postured, thanks to the curved design. Coming to the design, it features a steel frame that supports a body frame of 300 lbs. You’ll certainly need a camping chair that can last long and that is what you have with the KingCamp Lounge model. Thanks to its steel frame, it is durable and can serve you for a long time before it gradually gets weakened. A feature you’ll like is the adjustable lock. Once you have set the chair to your desired position, the adjustable lock is there to keep the chair positioned the way you kept it. Its foot pads and footrest are also slipping resistant so you can’t slip off and this also makes it sturdy on hard surfaces. The humanized seat line allows you to lean back when pushing the pedal. The adjustable properties allow you to fix it to your desired angle and the folding design allows for easy storage. With the foldable design and just 22.5 lbs weight, the KingCamp Lounge model can be folded to any size you want. 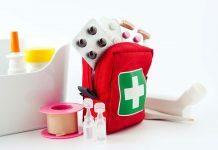 It can be folded to a size of 37.5 x 6 x 29” and can be easily transported in a car trunk or carried like a suitcase. The product comes with a 1 year warranty and this is a good move. So if you have problems with the chair, you can easily swipe it for a new one. On the downside, the KC Lounge model is…a bit expensive. 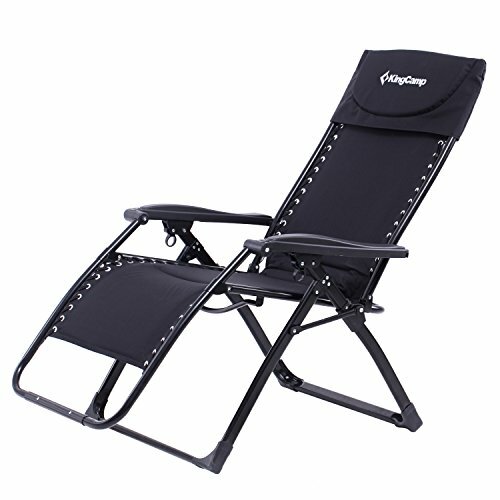 The KingCamp Patio Lounge Chair should be considered when you want to make a purchase. It is much more than a chair; you won’t be mistaken to call it a bed. It features a 75 x 24 x 12” anodized steel and 600D Oxford fabric seat. It supports a 300lbs body frame and is suspended by a double bungee system. There’s an ergonomic design that allows you to sit or recline comfortably without discomfort in your muscles. The design creates a nice balance between softness and firmness. It can be used as a bed and thanks to the triangular locking system, you can lock the chair to three positions such as recline, lay down and sitting up. Whichever position you chose, the triangular locking system got you covered. 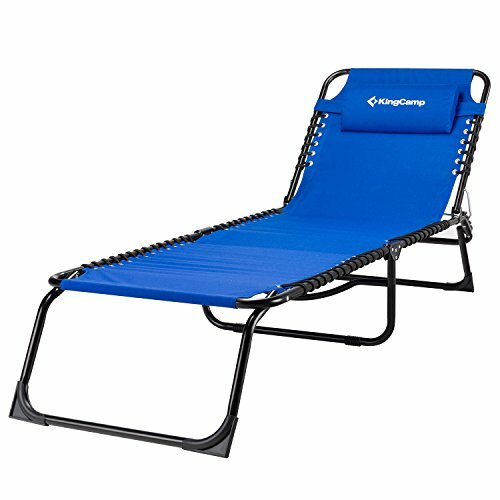 With a 13lbs size, the KingCamp Patio Lounge model is portable and can be folded into a 30 x 5.5 x 13.5” size. There is an adjustable padded pillow for additional comfort. The pillow can be used as a headrest and lumbar support and is also removable. 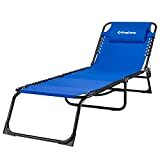 It is a great choice and can be used at the beach, camping ground, and patio. Its lightweight and foldable design allow you to transport it easily. The KC Patio Lounge Chair has a year warranty and can be returned when a deficiency is noticed. On the downside, it is quite expensive. The KingCamp Moon Saucer Chair makes your camping fun. Its rugged steel frame is heavy enough to support a 330lbs body frame. The 15” seat height is high enough to hold the tallest of campers and you won’t have to stretch your neck to catch a view. There’s a cooler bag at the back of the chair that keeps your drinks cool and fresh and at the front, there’s a cup holder that holds them within your reach. The padded seat with a round design offers you enough comfort and there’s a 600D breathable moisture-wicking Oxford fabric that keeps the seat comfortable. So you can now seat on it for hours without discomfort. The KC Moon Saucer model can alternate between open and closed positions in seconds and its 34.7 x 9.5 x 7.9” size saves you packing space, making it easy for transport and storage. 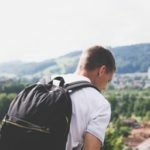 There is a carry bag with included shoulder strap for easy transport. The Moon Saucer is just about the product you might be looking for and it is quite affordable. 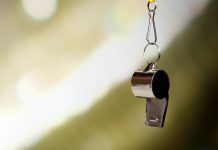 It is common to find pertinent questions on product reviews. The questions are there because users want to know what the product has to offer and what makes it better than its competitors. There have been questions repeated overtimes on KingCamp chairs and answers are offered to some of them. You can now make an assessment of the product you want to purchase and decide whether to continue with the purchase or not. 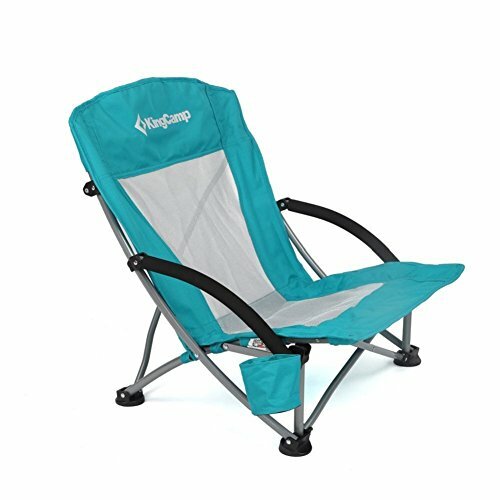 What is the maximum weight that a KingCamp Chair supports? There are many KingCamp chairs out there and each is designed with a suitable weight capacity. The weight of a KingCamp chair supports is based on its body and dimension. The supposedly lowest weight capacity is about 260lbs. The maximum weight that KC model supports is 300 lbs. The 300lbs or 136kg weight is the maximum weight for now. The question of whether KingCamp chair rust or not is dependent on the body. KingCamp chairs that are constructed with a steel frame are prone to rust when exposed to harsh weather conditions such as rain. When properly tucked away from the harsh weather, they can last for years without rusts. What are these chairs made of? KingCamp chairs are designed for the users’ comfort. KingCamp is notable for designing chairs with steel frames and anodized steel. The steel frame, however, seems to be the most popular because it’s a feature present on many models and only a few users could’ve spotted the anodized steel. So KingCamp chairs are made of steel frames and anodized steel. This was our take on KingCamp chairs. We’re pretty convinced that at least one of these suits your needs. Would love to hear your feedback, though, so feel free to leave a comment below and get this party started!